LAST MONTH, ONE of my former teachers was featured in the newspaper. It was in relation to her retirement on 23rd May 2014, after dedicating her teaching career to one school. The Star carried this article entitled “Something special and inspiring about PESS” (link) on 17 May 2014. My four sisters and I spent our secondary years in PESS. Four of us had the privilege of having Mrs. Yong as our Biology teacher. Other than the teachers, we naturally feel a special bond with the school that turns 100 this year. One: I found out that the writer who was my former colleague, was also a former student of the school, and was in fact in my eldest sister’s batch! Two: Another sister also discovered that her sister-in-law was also a former student too, albeit briefly! She was chatting online with her sister-in-law (now residing in Australia) and mentioned the article about her old school PESS. Lo and behold, her sister-in-law exclaimed, “Hey, that was my school too!” (but she had left in Form Two). The school is gearing up for its centenary celebrations in September. My sisters are going and many of my batch girls are going too, one flying in from Hong Kong and the other Australia. I wish I could be there too, to be part of this once-in-a-lifetime occasion! Alas, September is still a schooling month for the kids and Accra is simply too far and expensive to fly home 😦 I shall patiently wait to hear all about the big do from my sisters and friends. 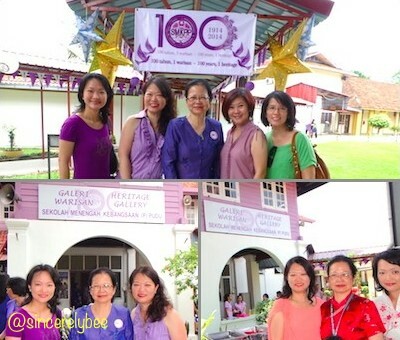 Our recent moments with Mrs. Yong… (Top and Bottom L) PESOGA Lunch on 21 Sept 2013; (Bottom R) PESS Chinese New Year Open House on 17 Feb 2014. This entry was posted in School Days, Star Stint and tagged PESS, School, Star. Bookmark the permalink.